One of my favorite dishes growing up was my mom's mustard chicken. I used to love helping her make it. She would pull the chicken out of the pan and make a sauce right in the same pan. I didn't know it at the time, but she was teaching me how to make a pan sauce, the most basic sauce in cooking by my book. Make sure you don't use a nonstick pan on this one because you want to get those brown bits forming on the bottom of the pan - that's what makes a good pan sauce. I'm updating her recipe just a touch by pounding the chicken breasts flat and serving mixed greens on top. Delicious. Pound the chicken breasts flat between two sheets of saran wrap. Season lightly with salt. Heat the oil in a pan (not nonstick) and saute the chicken breasts until just done, then remove to a plate. Add the mustards and half and half to the pan and simmer gently for 2 - 3 minutes. Return chicken to the pan and heat through and cover with sauce. Dress the lettuce with the lemon vinaigrette. 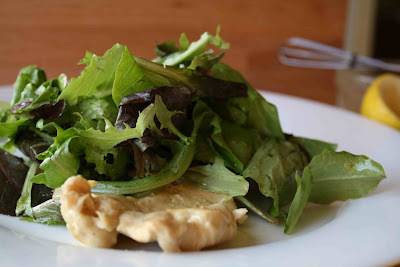 Place each piece of chicken on a plate and top each with half the mixed greens. Enjoy! now THIS IS RIGHT UP MY FOOD ALLEY! I love anything with mustard! Mmmm, you have my mouth watering. I've done this with pork chops and I know it's got to be fabulous on chicken. Great photos too! This looks so simple and tasty. Great for a weekday meal! Sometimes the most simple foods are the best. All the flavors get a chance to shine through. This looks like such a delicious recipe! Yum! I love your updates to it. I like chicken, espesialy chicken breast is low in fat,and healthy. Thanks for visitting to my blog!! Silly question for you - but what is half and half? This looks like a wonderful dinner. I love a yummy mustard sauce on chicken as it compliments its light flavor. Have you tried it on pork as well? Very delicious. Yours turned out perfect! So simple yet sounds sooo delicious! Perfect dish for quick yummy dinner. I found it! Cream with 12% butter fat content is called Extra Light Cream here in Aus... Light cream has 18% butter fat. Annie - That's great! And thanks for coming back to let us all know what you found and what it's called. Thanks!! !